Don’t see a day, time or class that works for you? Grab a friend and talk to a staff member about setting up a custom class offering! custom scheduling is not guaranteed, we will do our best to work with your schedule though! As someone new to the sport, or those getting back into climbing, this class will enhance your future experience in the vertical world. This course will teach the vital techniques needed to lead climb and belay in the gym. You will be given the opportunity to take and catch practice falls and learn clipping techniques and rope management under the guidance of our instructors. 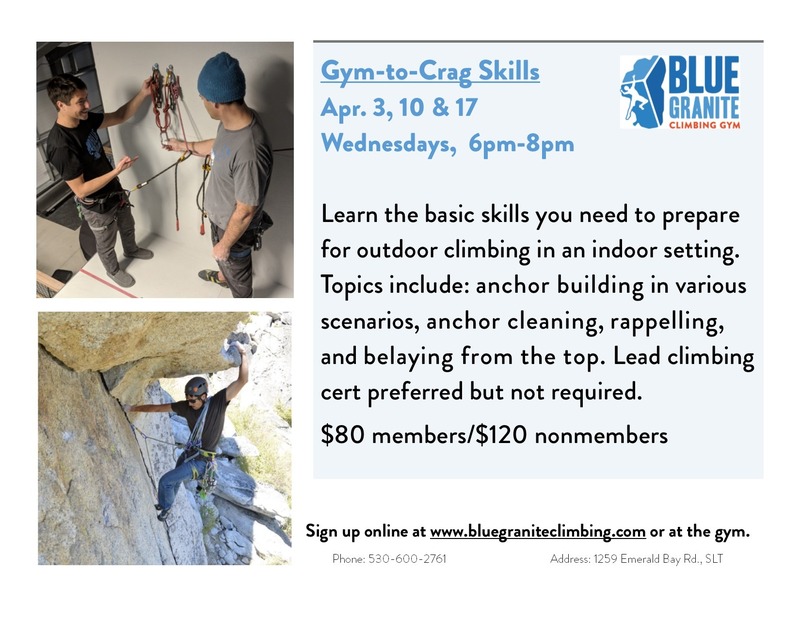 You will leave this class with the tools and confidence you need to pass a Blue Granite lead belay test. Please note: After completing the course, climbers will need to take and pass a lead belay test the next time they come into the gym to get their lead belay certification. All participants will get to take home some cord to build a friction hitch. Our goals are to build a base of high quality climbing movement for those looking to climb with improved efficiency. When you are climbing confidently and with movement awareness, climbing becomes more fun, and ultimately leads to better climbing. Prerequisites: “How to Rappel”, or at least 6 months of outdoor climbing experience.